As part of the “EU Support to Jordanian Democratic Institutions & Development (EU-JDID)” programme, NIMD is actively working to support a gradual democratic transition in the country. 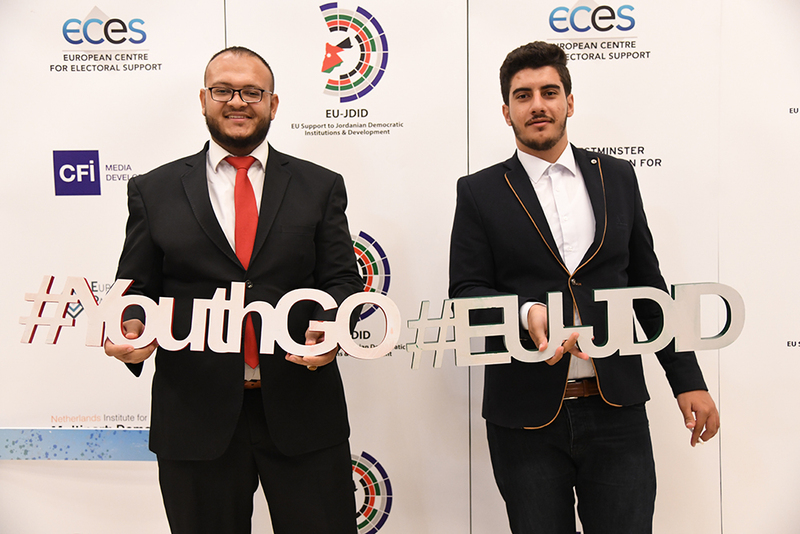 EU-JDID aims to accomplish this through initiatives which support the functions of Jordan’s House of Representatives and Independent Electoral Commission, as well as providing assistance to political parties. Recently in Amman, we saw the latest results of our important work in Jordan as 60 people graduated from the Strengthening the Capacity of Young Political and Civic Actors Trainee Programme. The EU-funded programme will benefit 220 youth participants though four annual political training programmes, which consist of ten monthly sessions. Experts in the field of political science are invited to lead the course, teaching classes on topics including policy analysis, political communications, democratic theory and debate techniques. The course also has a heavy focus on the involvement of women and young people. Each of the ten full-day sessions is split evenly between theoretical discussion and practical application. Organizers hope that with these skills at their disposal, the graduates can more effectively campaign for causes that matter to them and their communities across Jordan. Baker Abbadi, a Jordanian activist and current secretary general of the MOPPA, said that this kind of training is invaluable in contributing to political discourse that is not “destructive“ or plagued by people “spreading false information“. What next for the training programme? What is the EU-JDID programme? On top of the youth education programme, NIMD is contributing in the form of parliamentary support, electoral assistance and support to the political party system. This targeted approach is designed to aid the long-term establishment of trust in political actors and institutions, a central pillar of the UN Sustainable Development Goals (SDGs). The EU-JDID programme is supported by a consortium led by the European Centre for Electoral Support (ECES). The consortium is composed of the European Partnership for Democracy (EPD), Westminster Foundation for Democracy (WFD), Netherlands Institute for Multiparty Democracy (NIMD) and French Agency for Media Cooperation (CFI), with other aspects implemented by the Spanish Cooperation Agency, AECID. If you would like to know more about NIMD’s projects in Jordan and the wider Middle East, visit the project page or email us.